You’ve completed a background check on an applicant and he/she is disputing the information, now what? Section 611 of the FCRA provides the answer to this question. 1. Reinvestigation Required – If the completeness or accuracy of any item of information contained in a consumer’s, or applicant’s, file at a consumer reporting agency (such as Justifacts) is disputed by the consumer. The consumer notifies the agency directly, or indirectly through a reseller, of such a dispute, the agency must, free of charge conduct a reasonable reinvestigation. This reinvestigation will determine whether the disputed information is inaccurate and record the status of the disputed information, or delete the item from the file. This must be done before the end of a 30-day period beginning on the date on which the agency receives the notice of the dispute from the consumer or reseller. 2. Extension of period to reinvestigate – The 30 day period described in subparagraph 1, may be extended for not more than 15 days if the consumer reporting agency receives information from the consumer during that time period that is relevant to the reinvestigation. 3. Limitations on extension of the period to reinvestigate – Subparagraph 2 does not apply to any reinvestigation in which, during the 30-day period, the information that is being reinvestigated is found to be inaccurate or incomplete or the consumer reporting agency determines that the information cannot be verified. Before the expiration of the 5-business day period, beginning on the date on which a consumer reporting agency receives notice of dispute from any consumer or reseller, the agency must provide notification of the dispute to any person who provided any item of information pertaining to that dispute. The notice must be sent to the address and in the manner established by the person. The notice must include all relevant information regarding the dispute that the agency has received from the consumer or reseller. In general, a consumer reporting agency may terminate a reinvestigation of information disputed by a consumer if the agency reasonably determines that the dispute is frivolous or irrelevant. This includes a failure by the consumer to provide sufficient information to investigate the disputed information. Upon making a determination that a dispute is frivolous or irrelevant, a consumer reporting agency shall notify the consumer of such a determination within 5 business days. This must be done by mail or, if authorized by the consumer for that purpose, by any other reasonable means available to the agency. This notice must include the reasons for the determination and identification of any information required to investigate the disputed information, which may consist of a standardized form describing the general nature of such information. In conducting any reinvestigation with respect to disputed information, the consumer reporting agency must review and consider all relevant information submitted by the consumer. If any information is deleted from a consumer’s file, it may not be reinserted in the file by the consumer reporting agency unless the person who furnishes the information certifies that the information is complete and accurate. If any information that has been deleted from a consumer’s file is reinserted in the file, the consumer reporting agency must notify the consumer of the reinsertion within 5 business days after the reinsertion. This notification must be done in writing, unless the consumer has authorized, for that purpose, any other means of communication available to the agency. 5. A notice that the consumer has the right to request under subsection (d) that the consumer reporting agency furnish notifications under that subsection. A consumer reporting agency shall provide to a consumer a description, referred to in item 3 above, by not later than 15 days after receiving a request from the consumer for that information. 2. Provides written confirmation of the deletion and a copy of the consumer report that reflects the consumer’s file after the deletion, no later than 5 business days after making the deletion. If the reinvestigation does not resolve the dispute, the consumer may file a brief statement setting forth the nature of the dispute. The consumer reporting agency may limit such statement to not more than 100 words if it provides the consumer with assistance in writing a clear summary of the dispute. Whenever a statement of dispute is filed, unless there are reasonable grounds to believe that it is frivolous or irrelevant, the consumer reporting agency must, in any subsequent report containing the information in question, clearly note that it is disputed by the consumer. The consumer reporting agency must provide either the consumer’s statement or a clear and accurate codification or summary thereof. Following the deletion of information which has been found to be inaccurate or whose accuracy can no longer be verified, or any notation as to the disputed information, the consumer reporting agency must, at the request of the consumer, furnish notification that the item has been deleted or that the statement of dispute has been added to any person specifically designated by the consumer who has within the past two years received a consumer report for employment purposes, or within six months prior received a consumer report for any other purpose, which contained the deleted or disputed information. 3. If the reseller determines that the item of information is not incomplete or inaccurate as a result of an act or omission of the reseller, convey the notice of the dispute, together with all relevant information provided by the consumer, to each consumer reporting agency that provided the reseller with the information that is the subject of the dispute, using an address or a notification mechanism specified by the consumer reporting agency for such notices. Upon completion of a reinvestigation by a consumer reporting agency that received the notice of dispute from a reseller- the notice by the consumer reporting agency that received the notice of dispute from a reseller- the notice by the consumer reporting agency must be provided to the reseller in lieu of the consumer; the reseller shall immediately re-convey such notice to the consumer. No provision of this subsection shall be construed as prohibiting a reseller from conducting a reinvestigation of a consumer report directly. The clock starts ticking as soon as an applicant disputes any information reported by the CRA. 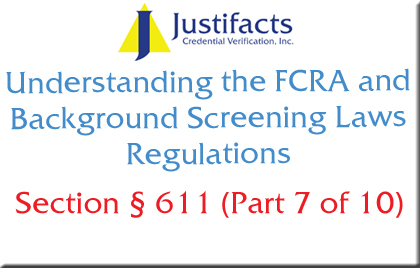 Consumer reporting agencies are required to take any information an applicant is able to provide and use it to reinvestigate the background check. Consumer reporting agencies must conduct this reinvestigation under a strict timetable and the results must be reflected in an updated report. Furthermore, if a dispute remains unresolved, applicants have a right to include a statement in their reports explaining their reasons for the dispute. In all instances, applicants have the right to a copy of their report. Furthermore, at the request of the consumer, it is the obligation of a consumer reporting agency to notify employers (or any others that have been provided with a background check) that changes have been made in the report.